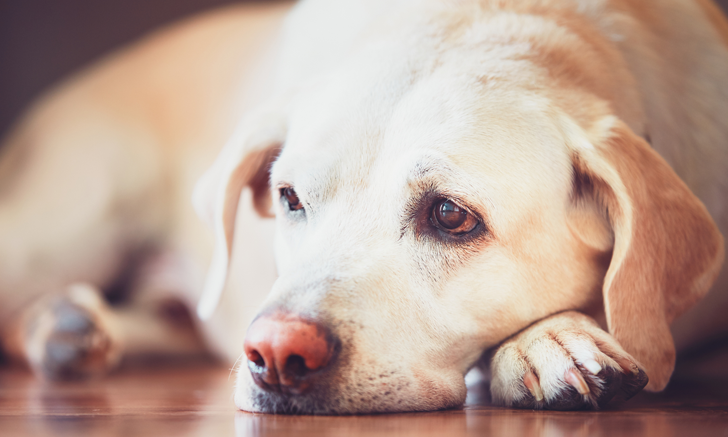 A 5-year-old neutered male Labrador retriever is presented for evaluation of decreased appetite, lethargy, and intermittent vomiting. The patient has a 3-year history of seizures occurring every 6 months; however, the frequency of his seizures has recently increased, with 3 seizures occurring in the past 2 months. An investigation into the cause of the seizures has not been performed. The patient also has bilateral hip osteoarthritis. Serum chemistry profile reveals increased liver enzymes (ALP, 437 U/L; reference range, 10-130 U/L and ALT, 885 U/L; reference range, 10-120 U/L), mild hyperbilirubinemia (1.8 mg/dL; reference range, <0.3 mg/dL), and hypoalbuminemia (2.2 g/dL; reference range, 2.6-4.0 g/dL). Abdominal ultrasonography reveals a coarse echotexture in the liver but no other abnormalities. Prothrombin time and activated partial thromboplastin time were both within the control ranges. A liver biopsy shows chronic hepatitis with moderate lymphoplasmacytic and neutrophilic infiltrates, as well as moderate bridging fibrosis. There is increased staining for copper, and liver copper concentration is 2143 ppm on a dry-matter basis (normal, <400 ppm; toxic, >1500 ppm). Aerobic and anaerobic cultures reveal no growth. Correct ResponseSafePrednisone is indicated to manage the inflammatory component to this patient’s liver disease. Considering the breed predisposition to copper hepatopathy1 and the concentration of copper in this patient’s liver, copper hepatopathy is likely to be the primary cause for the liver disease; special stains of the liver for copper could help further confirm this. The copper accumulation is centrilobular (zone 3) in the primary (ie, breed-related) form and periportal in the secondary (ie, cholestatic) form. Management of the secondary inflammation is indicated to reduce ongoing liver injury. Well known side effects of prednisone include polyuria, polydipsia, and weight gain. Other side effects, such as hepatomegaly and increased ALP, may confound the assessment of clinical improvement. Although ALP may increase further, a decrease in total bilirubin and ALT should be expected with successful treatment. Correct ResponseProceed with CautionCyclosporine inhibits T-cell function and has been used in dogs with various inflammatory and immune-mediated diseases, including atopic dermatitis, inflammatory bowel disease, and immune-mediated hemolytic anemia.2 Anecdotally, cyclosporine may also be a useful anti-inflammatory agent for the management of inflammatory liver disease. However, in the absence of more extensive studies, routine use of cyclosporine cannot yet be recommended. In addition, cyclosporine is largely metabolized by the liver, and this patient’s liver function is suspected to be reduced based on the presence of hypoalbuminemia and hyperbilirubinemia. Ideal blood concentrations of cyclosporine are not known in dogs, and the effects of liver disease on drug metabolism may make this patient’s response unpredictable. GI signs are the most common side effect of cyclosporine, and this patient already has a reduced appetite. Despite these caveats, cyclosporine would be a reasonable choice if the patient does not tolerate prednisone or if prednisone is ineffective as a sole anti-inflammatory drug. Potential adverse effects of cyclosporine include gingival hyperplasia and opportunistic infections. The most common side effects are vomiting and inappetence. Concurrent administration of an antiemetic may help manage these signs. Treatment with D-penicillamine may be needed for 6 to 9 months to clear accumulated copper from the liver.4 Although response to treatment and duration of treatment should be assessed based on repeat liver biopsy and copper quantification, this is often not feasible. Correct ResponseProceed with CautionMaropitant may be useful for controlling this patient’s vomiting associated with the primary liver disease or with D-penicillamine treatment. Although maropitant is an effective antiemetic, this patient may also be experiencing nausea; it is not clear whether maropitant can effectively control nausea.6 Maropitant is metabolized by the liver and excreted in the bile; thus, caution should be taken in dogs with liver dysfunction. This drug has a wide therapeutic index, with doses 3 times the highest label dose of 8 mg/kg being well tolerated in dogs,7 and significant adverse events are unlikely. Correct ResponseSafePotassium bromide would be a safe anticonvulsant to use in this patient. Bromide does not need to be metabolized by the liver and is eliminated in the urine.8 Prior to initiation of treatment with potassium bromide, blood ammonia levels should be measured to rule out seizures secondary to hepatic encephalopathy. However, the long-standing nature of this patient’s seizures is more suggestive of pre-existing idiopathic epilepsy, with incidental progression of seizures concurrent with the diagnosis of copper hepatopathy. The most significant disadvantage of potassium bromide is its prolonged half-life (≈2 weeks).8 Because 5 half-lives may be required to achieve steady state drug concentrations, there may be a lag in achieving seizure control. Administering loading doses may achieve steady state drug concentrations sooner but could increase the risk for sedation, which would be undesirable in this patient. Correct ResponseSafeLevetiracetam would be safe to use to control this patient’s seizures. It is not hepatically metabolized, has no significant potential for hepatotoxicity, and is excreted primarily in the urine,8 making it a potentially useful drug in patients with seizures and concurrent liver disease. However, studies confirming levetiracetam’s efficacy as monotherapy for the control of seizures in dogs are lacking.8 Another potential use of levetiracetam in this patient would be as an add-on therapy in combination with potassium bromide to assist with seizure control while serum blood bromide concentrations reach therapeutic levels. Correct ResponseProceed with CautionAlthough metronidazole is not contraindicated in this patient, there are no indications for its administration. Bacterial culture results from the liver were negative, and metronidazole is a narrow-spectrum antibiotic with no significant activity against aerobic bacteria. Although it is often suggested that metronidazole has anti-inflammatory effects in the GI tract, it has been proposed that these effects may be mediated through modification of GI microbiota.9 Because the liver lacks a significant commensal bacterial population, the anti-inflammatory effects of metronidazole are likely to be less in the liver. As noted above, it is unlikely this patient’s seizures are due to hepatic encephalopathy. However, if elevated blood ammonia levels were documented, metronidazole could be used with lactulose to help manage hyperammonemia and hepatic encephalopathy. Correct ResponseDo Not UseCarprofen is contraindicated for management of this patient’s osteoarthritis. NSAIDs are largely metabolized by the liver and have narrow therapeutic margins and therefore should be avoided in patients with liver dysfunction. In addition, carprofen has been associated with idiosyncratic hepatotoxicity. One study of carprofen-induced hepatotoxicity included a preponderance of Labrador retrievers, although this finding may be a reflection of the breed’s predisposition to osteoarthritis and other forms of liver disease.10 Patients with significant liver dysfunction are also at higher risk for NSAID-induced GI ulceration, as portal hypertension—which cannot be excluded in this patient—is an independent risk factor for gastric ulceration. Concurrent administration of NSAIDs with glucocorticoids is contraindicated. Dirksen K, Fieten H. Canine copper-associated hepatitis. Vet Clin North Am Small Anim Pract. 2017;47(3):631-644. Viviano KR. Update on immununosuppressive therapies for dogs and cats. Vet Clin North Am Small Anim Pract. 2013;43(5):1149-1170. Langlois DK, Lehner AF, Buchweitz JP, et al. Pharmacokinetics and relative bioavailability of D-penicillamine in fasted and nonfasted dogs. J Vet Intern Med. 2013;27(5):1071-1076. Fieten H, Dirksen K, van den Ingh TS, et al. D-penicillamine treatment of copper-associated hepatitis in Labrador retrievers. Vet J. 2013;196(3):522-527. Hoffmann G, Jones PG, Biourge V, et al. Dietary management of hepatic copper accumulation in Labrador Retrievers. J Vet Intern Med. 2009;23(5):957-963. Kenward H, Pelligand L, Savary-Bataille K, Elliott J. Nausea: current knowledge of mechanisms, measurement and clinical impact. Vet J. 2015;203(1):36-43. Plumb DC. Maropitant citrate. Plumb’s Veterinary Drugs website. https://www.plumbsveterinarydrugs.com/#!/monograph/ufI3PM2LJI/. Accessed July 11, 2018. Podell M, Volk HA, Berendt M, et al. 2015 ACVIM small animal consensus statement on seizure management in dogs. J Vet Intern Med. 2016;30(2):477-490. Jergens AE, Crandell J, Morrison JA, et al. Comparison of oral prednisone and prednisone combined with metronidazole for induction therapy of canine inflammatory bowel disease: a randomized-controlled trial. J Vet Intern Med. 2010;24(2):269-277. MacPhail CM, Lappin MR, Meyer DJ, Smith SG, Webster CR, Armstrong PJ. Hepatocellular toxicosis associated with administration of carprofen in 21 dogs. J Am Vet Med Assoc. 1998;212(12):1895-1901.